Louisa Flindell was born in Birmingham, Warwickshire, England on November 12th 1840. She was the sixth child of Francis Bassett Shenstone (FBS) and Joanna Elizabeth Flindell. Louisa was baptised at St Martin’s Anglican Church, Birmingham on May 10th 1842 with her older sister Mary Ann and younger sister Joanna. She was probably named after her father’s youngest sister Louisa who died in her infancy. 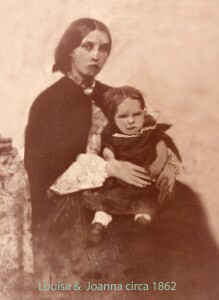 Prior to her fourteenth birthday, the family moved to Wembdon near Bridgewater in Somerset where her father either bought, or became a partner in, the Bridgewater Times newspaper. The following year her baby brother, Henry Conquer was born in Bridgewater, then two years later her baby sister Elizabeth. In 1854, Louisa’s father and her older brother Richard joined the Commissariat for the Crimean War (1854-1856). It is not known what happened to the family, but one can speculate they either remained in Somerset, or more likely they moved to London which was their address before emigrating. The Flindell family sailed from Plymouth on September 23rd 1857, seven weeks short of Louisa’s 17th birthday. They took passage in the “Nile”, carrying 268 prisoners and 40 warders, including her father and eldest brother James, and free passengers bound for the Swan River Colony. They arrived at Fremantle on January 1st 1858. Joanna Frances born November 2nd 1861. She married Thomas Wilberforce Gladstone-Hopwood on May 19th 1883. They had seven children. Joanna was 87 when she died. Ellen Louise born November 15th 1866. She married Joseph Thomas Shaw. They had four children. Ellen was 84 when she died. James and Louisa should have enjoyed their first years of marriage, which by the standards of Colonial days was the joyous, but that was to come to an abrupt halt. The month before the birth of their first child Joanna, Matthew Henry Watson, the younger brother of James, was to die in tragic circumstances (see The Watson Family below). These were hard times and the settlers for made of stern stuff. Joanna’s birth would have been a tonic for the family. This would have been fortified when Louisa became pregnant with Ellen. Once again Fate intervened when about 1866, James died, however no records have been found so this date cannot be validated. This had a profound effect on Louisa. No doubt the loss of her husband, possible post natal depression and concern about providing for her two young daughters took its toll. There have been conflicting dates for Louisa’s death. November 18th 1867, the sixth anniversary of their wedding and three days after Ellen’s first birthday, seemed to tie in with family lore. Francy De Grys, Louisa’s great granddaughter and an early family historian, claimed Louisa died of heart attack shortly after husband’s death, however, she recorded that the date of death was unknown as it could not be traced at The Registrar General’s Office. This would make her death between 1867 and 1869. Len Flindell another family historian, promoted 19 Oct 1871 as the date of her death, which along with other commentators seemed more accurate. An inscription on the tombstone of her mother Joanna Flindell deserved research. This was the death of Emma Watson on September 11th 1873 age 31. Skinner Street Cemetery records confirm this. The Bicentennial Dictionary of Western Australian pre-1829 – 1888 indicates Louisa was referred to as Emma. If this is so and it probably is, the age on the tombstone is incorrect and should be 32; a minor variation in the circumstances. Family lore had it that twelve-year-old Joanna was taken in by her widowed grandfather Francis Bassett Shenstone (FBS) and six-year-old Ellen by Louisa’s sister, Mary and her husband George. About this time FBS moved to Guildford and was deeply involved in local politics, the formation of a central show society and promoting the building of the railway from Fremantle to Guildford and the Eastern Districts. Certainly with the death of both parents, Joanna and Ellen needed the security of being together, so it seems more likely that this was an interim solution and subsequently both girls were then taken in and reared by Mary and George Thompson. Anne and Thomas Farmer with their sons Thomas and William arrived on June 8th 1829 aboard HMS Sulphur as members of the First Fleet. Thomas was a private in the 63rd Regiment. Samuel was the first of their children to be born in the Colony. Anne was pregnant with her fourth child when her husband drowned at The Causeway Flats on the Swan River in 1832. William Watson arrived in the Colony aboard the “Hooghly” on February 12th 1830 and was therefore among the earliest settlers. He was 34 and his occupation on arrival was gardener. Later he operated the Redcliffe Public House (1834 to 1838). William married Anne just before her fourth child, Joseph Farmer Watson, was born. William accepted responsibility for her three sons and adopted Joseph. Anne was to have five more children to William, James being the first born. The others were Charles (1836-1905), Annie (1838-1911), Matthew Henry (1840-1861) and Isaac (1844-?). A fatal gun accident occurred on Sunday when Mr Watson lost his life by the accidental discharge of his fowling piece. The unfortunate young man had just left Mr Powell’s house near the Canning Bridge and proceeded towards the river to have a shot at some porpoises. While waiting he pulled the muzzle of his gun hastily towards him, and suddenly raising it, either the hammer or the trigger was caught by a bush and the contents of the piece discharged through the head of the deceased, causing instant death. The inquest was held on Monday when a verdict of accidental death was returned. William died in May 1843. The cause and timing of his death and the birth of Isaac should be refined to clear any mischievous conclusions. Again after a suitable period of mourning, Ann married Thomas Walker in Perth on November 12, 1843 (Certificate 88 of 1843). Sadly Thomas died in March 1844.